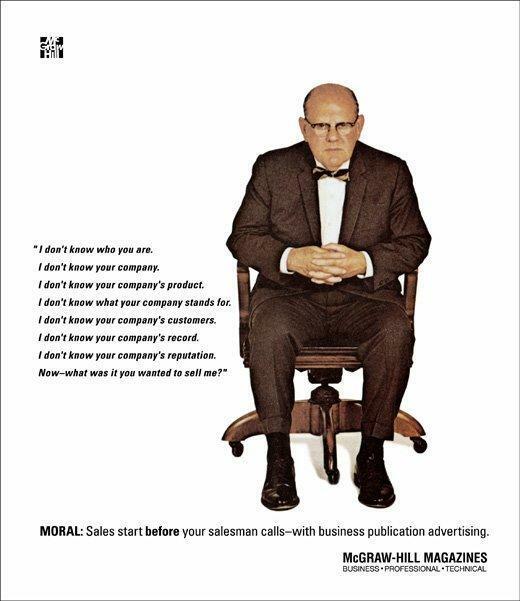 I first came across this advert in a textbook on advertising when I began studying marketing years ago. Then it recently reappeared in my Twitter feed, and I looked at it again. It works well on so many levels. The simplicity of the creative idea: a single image of a hard-nosed, sceptical buyer leaning forward in response to some poor salesperson’s pitch (we’ve all been there); the superb copywriting, capturing every objection in seven lines; the deliberate use of simple black and white (our eyes are drawn to contrast). But what struck me most was just how relevant this advert is today. If you ever need to make a convincing argument for investing money in marketing communications, advertising and public relations, show them this. The commercial world is already tough enough. Why make it harder than necessary?